Absolute Building Solutions is pleased to offer a line of shingle roofing products from Malarkey Roofing Products. This line of shingles have several distinct features that provide protection for home owner's roof for the demanding conditions here in the Traverse City area. Scotchgard™ protection from 3M - Algae growth on a roof can cause black streaks, which can alter the color of your roof and make it appear aged. Scotchgard™ Protector helps maintain the aesthetic appearance of your roof, reduce the need to clean your roof and includes a 20 year warranty. Double Rain Seal Protection – Malarky laminate shingles contain a double SEBS asphalt rain seal to provide protection against wind-blown rain entering beneath the shingle. The shingles contains adhesive properties that join the shingle together and cohesive properties to prevent it from separating. SEBS is flexible down to 0°F (-18°) which ensures the rain seal remains intact through freezing and thaw cycles. Superior Granular Embedment – The quality control and exceptional materials used ensures superior granule adhesion and durability to protect your investment. Patented Nailing Area – One of the most critical aspects of a successful roofing project is correct installation. Malarkey laminate shingles contain a patented nailing area that is over three times larger than other laminate shingles and drastically improves correct fastening. Enhanced Wind Warranty – Shingles are eligible for a 130 mph enhanced wind warranty when installed correctly. Warranty – Limited Lifetime Warranty against manufacturing defects is included in most Malarkey shingles. A unique feature of the Malarkey products is the Right Start™ period which is a multi-year, non-prorated warranty period designed to protect your shingle investment. During this initial period shingles do not depreciate and you enjoy 100% warranty coverage. During the Right Start™ period the warranty may be transferred to a subsequent owner, entitling them to the same coverage as the original owner! 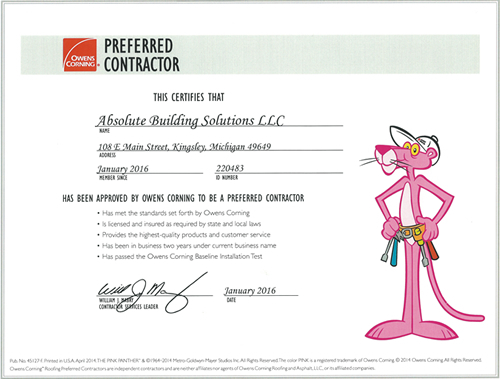 Absolute Building Solutions is certified to install Malarkey Roofing Products which allow us to offer additional warranty coverage. Give us a call at 231-263-8300 or fill out our contact form for more information. Below are the products lines we install in the Traverse City area. Learn more about Malarkey Roofing Products and make sure to view their line of products. 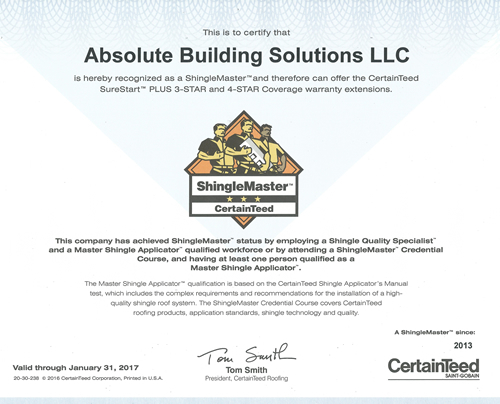 Absolute Building Solutions is certified to install CertainTeed shingles as well as Owens Corning shingles. We are here for you and ready to answer your questions. Give us a call at 231-263-8300 or fill out our contact form.